Built in 1857, the Union Congregational Church is an icon of the town, easily visible as one enters the thoroughfare. Visiting ministers officiate the congregation’s summer services, which commence at 10am on Sundays. 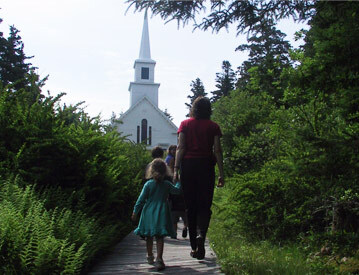 Ever approachable by its boardwalk or driveway, the grounds of the church are ideal for seeking peace at any time of year. In the off-season, aboard its all-weather mission boat, the Sunbeam, the Maine Seacoast Mission provides non-denominational worship meeting and a variety of community support services, including a tele-med link to a physician on the mainland.